Before becoming a journalist, Alma Guillermoprieto studied dance with the great Merce Cunningham. In a post for The New Yorker in 2009, she recalled a birthday dinner he once threw for himself with pedestrian food served on paper plates in his shabby, rented loft. She saw those as signs, not of self-denial, but of a man “who woke up every morning, every day of his long, productive life, focused on nothing but making the best dance possible that day.” Guillermoprieto found his lack of interest in anything but work astonishing, yet that kind of intense focus also describes Guillermoprieto’s own decades-long career writing the illuminating newspaper and magazine articles and books on Latin America for which she has been honored with this year’s IWMF’s Lifetime Achievement Award. Guillermoprieto, 60, is hardly the ascetic her mentor seems to have been. Though she spends much of her time on the road, reporting throughout Latin America and the Caribbean, she also routinely returns to a Mexican village home of her own. She has a dramatic sense of style that makes its appearance in bob haircuts or a blood-red rebozo, worn to deliver a lecture on Mexico’s conflicted history and sense of identity. Above all, she has a beautiful writing style that exposes her intimate appreciation for the variegated pleasures and unbearable pain that makes up the texture of life. The needle of Guillermoprieto’s compass, by contrast, always pointed back to Latin America. Born in Mexico and raised in New York during her teenage years, she is truly bilingual and bicultural. She studied modern dance with Cunningham and Martha Graham before turning to reporting in the 1970s, first for The Guardian of Britain, and then for The Washington Post. She began covering the civil wars of Central America in the 1980s and when many of her correspondent colleagues began hopping from continent to continent afterwards, she remained in her native land. “I wanted to stay in Latin America to understand it and myself,” Guillermoprieto said. “I’ve been in the unusual position, and privileged among Latin American writers, in that I speak English well enough to address a foreign audience. I can explain Latin America from a Latin American point of view to a U.S. audience.” And she has. Guillermoprieto first made her mark in journalism 1982 when she and New York Times reporter Raymond Bonner risked their lives to break the story of a massacre of 1,000 villagers at El Mozote, in El Salvador’s Morazan Province, by elite, U.S-trained army forces. The reports were denied and denounced by officials in the administration of then President Ronald Reagan, who also tried to discredit the reporters. But officials eventually were forced to acknowledge the slaughter, details of which were confirmed many years later when the mass graves were unearthed. Guillermoprieto reports long and hard and when she sits down to write, that’s all she does. She has written about Argentina’s “dirty war,” the Shining Path rebels in Peru, the civil war and drug trafficking in Columbia, and more recently, the drug wars in Mexico. Almost always, she has focused not on policy, but on the foot soldiers, consumers and victims of these wars, which are themselves the results of someone’s policy. She writes with equal comfort about macho politicians, the populist caudillo politics of Venezuelan President Hugo Chavez, gay marriage, samba dancing, soap operas, the impoverished favelas of Brazil, Mexican film, religion and so many more threads of Latin American society that weave together so naturally in her hands. “I am interested in how Latin American societies modernize and deal with modernization through consumerism, instead of having a stake in society. Another concern of mine is religion. I’m interested in what people believe in and what they look to for strength. The natural inclination in any society is to look at what they don’t understand about another society as bizarre and grotesque. For example, these new cults related to the drug war, Santa Muerte and Saint Judas seem so grotesque. But I am interested in how people are looking to faiths for sustenance, and how more traditional faiths have not been able to provide succor for them,” she said. “I take things that seem exotic or folkloric, like mariachis, and look at how they are trying to find their place in a changing society, how they feel lost in the process of modernization,” she said. In addition to writing for The New Yorker, the New York Review of Books and several Spanish-language publications, she has written several books including The Heart That Bleeds: Latin American Now; Looking for History: Dispatches from Latin America; Samba; and And Dancing with Cuba: A memoir of Revolution. She has received MacArthur and Neiman fellowships and a George Polk Award for a series of articles about Columbia. As one of the foremost experts on Latin American culture, she was inducted into the American Academy of Arts and Letters in 2003. “If you want to understand what’s happened in Latin America over the last 30 years, if you want to feel what it was like or see what it has to do with you, you simply have to read Alma Guillermoprieto,” said Philip Bennett, former Managing Editor of The Washington Post and a professor of journalism and public policy at Duke University. 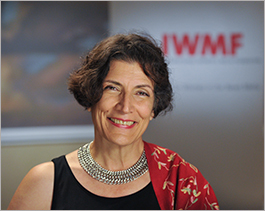 Alma Guilllermoprieto is the second IWMF Lifetime Achievement Award winner from Mexico, following Elena Poniatowska (2006).